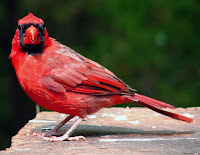 A male cardinal is the most common, North American “animal” of size that is virtually all red, a color used by few wildlife species hereabouts. We have a few small red beetles and salamanders plus several birds, like tanagers, that mix bright red with other others, but what else is almost all-red? Cardinals don't seem to need camouflage. Ornithologists say male cardinals have probably evolved their bright, distinctive color to attract female cardinals. However, how do they survive so well in the wild with such a rare, flashy outfit that, even among the fully leaved trees of summer, seems to stand out like a sore thumb? Hawks see red. Why, then, don’t they decimate the population of male cardinals, which seem to do little to hide themselves, especially in winter when the deciduous trees have no leaves for cover. The answer probably lies in our own perception of color vs. a bird’s perception. “Birds see very differently from the way that we do,” says Chris Elphick, assistant professor of ecology and evolutionary biology at the University of Connecticut. “They see into the ultraviolet ranges and have different types of receptor cells in their eyes, so a bird that seems the brightest to us is not necessarily the brightest to another bird — such as a hawk. “How a hawk sees a cardinal — or anything else — is thus hard for us to conceive,” he adds. An evolutionary biologist named John Endler found that how a color looks can depend on surrounding colors because of the wavelengths of light that are absorbed by the environment. Thus, in the forest full of green, red light tends to be absorbed, so red objects would not stand out the way they would against, for instance, a snowy background. “This phenomenon helps explain why scarlet tanagers — or any number of warblers — can be so hard to pick out even when there are not leaves obscuring them,” Professor Elphick observes. He adds: “It’s important to remember that evolution always involves a balance between benefits and costs. Being conspicuous has potential costs — e.g., increased predation risk — but if those risks are balanced by greater benefits — e.g., more/better reproductive opportunities — then maybe that’s OK, evolutionarily speaking. Laura Erickson, science editor at the Cornell Lab of Ornithology, reports that hawks can definitely see red. “But they can see a whole spectrum of colors, and much of their favored prey is more muted in color, so there is no good reason for hawks to focus on cardinals. “Cardinals, like Scarlet Tanagers, spend much of their time hidden in foliage, and it’s very difficult for even accipiters [bird hawks] to grasp prey from the branches that cardinals favor. “Goldfinch or Prothonotary Warbler yellow, Blue Jay blue, and oriole orange are almost certainly at least as vivid to a hawk’s eyes.